The following is a selection of guest comments. Kelso, larger than life, certainly Conny & Jill, displays his affection for Conny. Kelso, just 2 years old, according to Conny is 'just a huge baby', 75% Doberman, 25% Great Dane. Like any other youngster he likes to play especially with a ball. Why the name Kelso? Conny and Jill just love Scotland so much that they named him after the Scottish town! 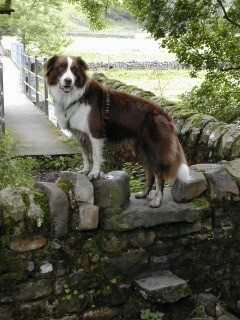 After a camping holiday in the Trossachs they plan a stay in Hebden Bridge before returning home. Wulfred (Paul on the left) and Alf (Ian), two Saxon warriors, "stayed at this fine establishment" before going into battle against the vicious Viking hoards, led by the infamous Viking King Eric Bloodaxe. 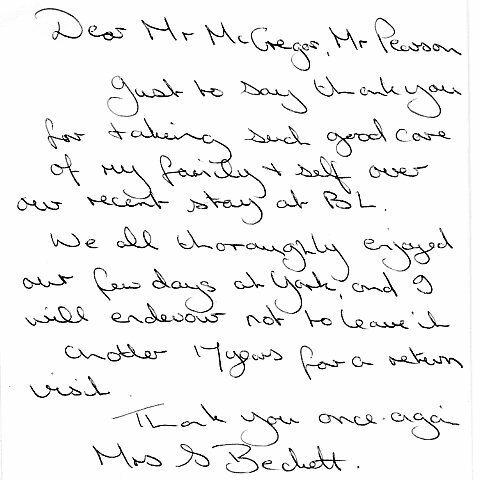 "Very warm welcome, really enjoyed our stay, we will return. Food excellent"
"Just what we needed after a 170 mile cycle ride! Thank you for your kind welcome - and lovely breakfast!" We provide secure, locked and alarmed garage facilities, free of charge, for cycles, motorbikes and mobility scooters, just what Emma and Mike wanted. Just a line or two to say thank you for the excellent stay at you guesthouse last weekend. Our son is currently studying in York University and we were up visiting from North Wales. Your property is so coveniently situated - only 10 minutes walk from the University and the same into the centre of York - an absolutely ideal situation. The parking facility is brilliant as any parking space in York and surrounding area is at a premium. We would certainly recommend your guesthouse to anyone visiting their sons or daughters at the University, or for a convenient base for touring the York area. Thank you both again for a lovely stay - it felt like being at home - relaxed and friendly. We hope to come again and will certainly recommend you to our friends. Regards Peter and Janet Brand"
"York has something for everyone of all ages. Very historical, great restaurants and fantastic welcoming pubs. York is the type of place you can be as busy or chilled out as you like. Bull Lodge is the ideal base to be, just outside the city walls. Roy & Dennis are the perfect hosts, nothing is too much trouble. They always make you feel at home and keep you up-to-date on what is happening in York while you're visiting. 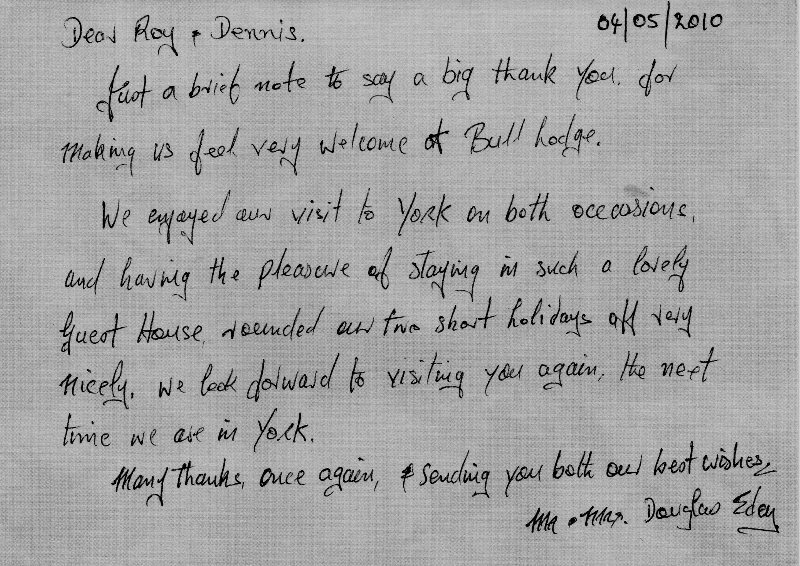 We would recommend Bull Lodge to anyone looking for accommodation in York. We hope to be visiting for many years to come." Liz & Keith seated on the right enjoying the 'banter' at breakfast. ! Robert, an Antiquarian bookseller, together with almost 200 other dealers was here for Europe's largest Antiquarian, Rare and Out of Print Book Fair, held at York Racecourse. The annual event was celebrating its 35th year. 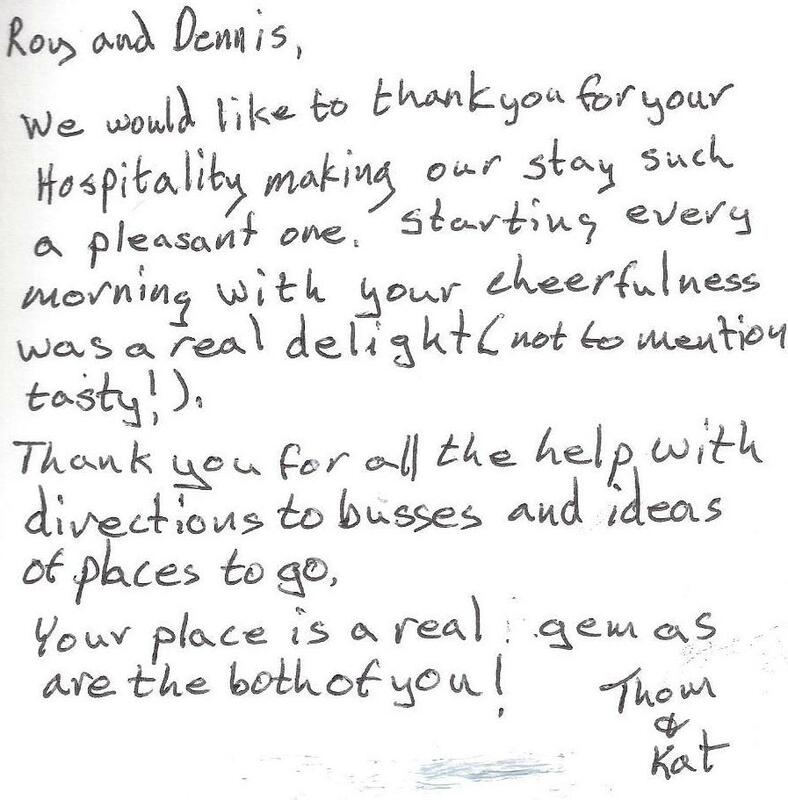 Robert praised us saying we offered "Value for money accommodation". He particularly enjoyed breakfast "How nice it is to be served food hot, unlike many B&Bs where it is served luke-warm, and cold before you've eaten it". "Ideal location. Warm Welcome. Very good all round. Will Return". True to their word Ron and Chris returned again this August, 2010, to take part in the 'Sunk Island Run' and 'The Golden Era Run' for pre 1931 machines again based at Elvington Airfield. Ron and Chris proud owners of their 1928 Montgomery 680cc VEE Twin motorcycle, nicknamed 'Rommel', which was made in Coventry (like the current owner! ), pointing out the clutch cover which started life as a non-stick saucepan bottom! It took Ron three and a half years to restore Rommel from an abandoned wreck. As spare parts were completely unobtainable for this rare make it meant a great deal of ingenuity had to be employed hence, for example, the use of the saucepan. Due to its rarity and condition Rommel has won several awards at vintage club runs (two at the 'Banbury Run' where 600 bikes take part). Rommel is the favourite motorcycle of Ron and Chris's small collection of vintage motorcycle club eligible machines and is a real character! Owner Sigurd looks on as his Samoyed Nanuq (Eskimo 'Ice Bear') poses. His wife Birgit coaxes Nanuq from behind the camera 'getting him to put his best paw forward'. 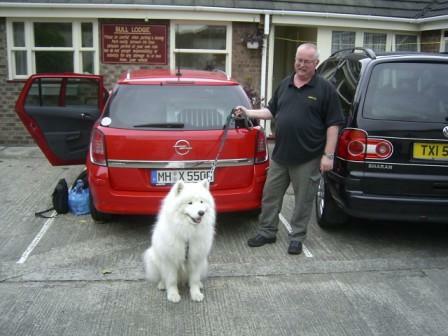 Sigurd, Birgit and Nanuq stayed with us in 2009; it was Nanuq's first foreign trip. They had journeyed for over 12 hours by car from Germany through France, by ferry to Dover and onward by road to stay with us overnight before commencing a touring holiday in Scotland. In August 2010 we welcomed them back for a two night stay when they had more time to experience York (though Nanuq was keener on discovering our kitchen!) before moving on again to Scotland. Devotees of the world renowned Early Music Festival, held annually in York, Philip and Gavin are regulars having stayed with us since 2000. "Bull Lodge is convenient for concert locations; especially St. Margaret's Early Music Centre at Walmgate, the Jack Lyons Hall, University of York, as well as the many other venues in the City centre. We have all the facilities we need at Bull Lodge - suitable accommodation, secure storage and free recharging facilities for my mobility scooter" says Philip. "Easy access to St. Nicholas Fields Nature Park, just at the bottom of Bull Lane, enables me to walk and exercise Nathan making the location ideal for us" says Gavin. 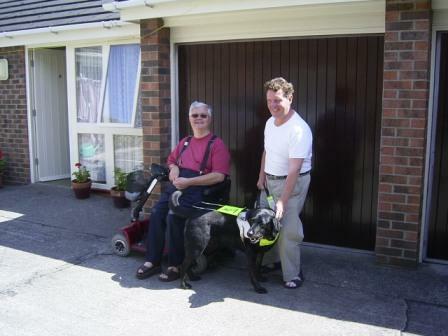 Philip and Gavin with his working guide dog Nathan outside our secure garage where you can stow your bicycle, motorbike or mobility scooter free of charge. "Excellent. Clean and quiet. A quality breakfast for all tastes and appetites." "Gorgeous breakfast, lovely host, brill room, spotlessly clean & very comfy. Thanks"
"Lovely stay! Quiet area and fantastic breakfast. "Very welcoming, very comfortable, very good." "Excellent. Very friendly. Very Clean." "Immaculate room and great breakfast"
Bluey, an Australian Shepherd dog, was our first overseas four legged friend to stay with us in August 2004. She was accompanied by her mistress, Birgit Oelkers, from the Netherlands. Birgit spent her mornings studying English for business and much of her free time with Bluey exploring the Moors countryside. Birgit found St. Nicholas Fields, on our doorstep, ideal for exercising Bluey before breakfast and before bedtime.